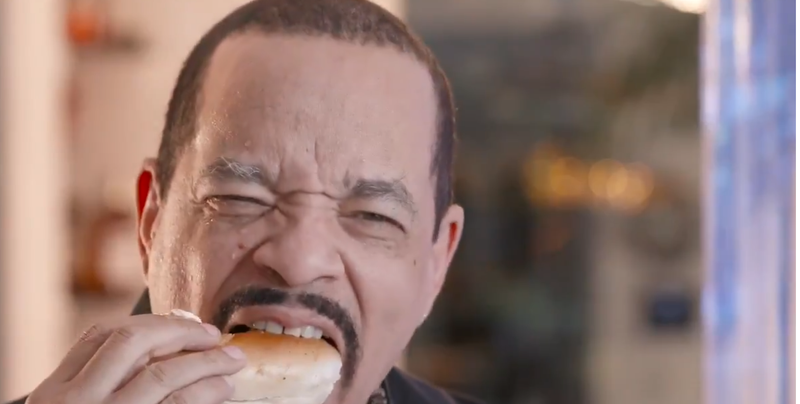 You might remember that time we all lost our goddamn minds two weeks ago, when rapper/Law And Order mainstay Ice-T revealed to the world his shameful secret: He’s never had a black coffee and a bagel, those life-giving staples of New York life. As it turns out, though, the problem wasn’t that the man behind Body Count has an aversion to circular bread; it’s just that no one had paid him to try it yet. On the one hand, yes, this is really just a commercial for a dating app attempting to capitalize on a bizarre viral moment. On the other hand, though, there is undeniable joy in watching Ice-T take his first drink of black coffee, and then attempt to describe its flavor as “Tastes like water, with…something, another taste kicked in later.” (Also, all of his bagel comparisons seem to start from the point of, “Why isn’t this a donut?”) Not to get all John Mulaney on the topic, but we’re pretty sure we could watch, conservatively, a million hours of Ice-T trying foods he’s never had before, and then trying to put his feelings about them into words. Get on it, Food Network.